In the fall of 2018, I did a sermon series at Resurrection Church Called “The Way of Love: Practice for a Jesus-Centered Life.” The series was based on Presiding Bishop Curry’s invitation to the Episcopal Church to explore various practices each day that would help us live a life of love as Jesus taught. During that time, we also used the study for the basis of our “Food and Faith” conversation- a monthly gathering that takes place at the Panera Bread in Hermitage. 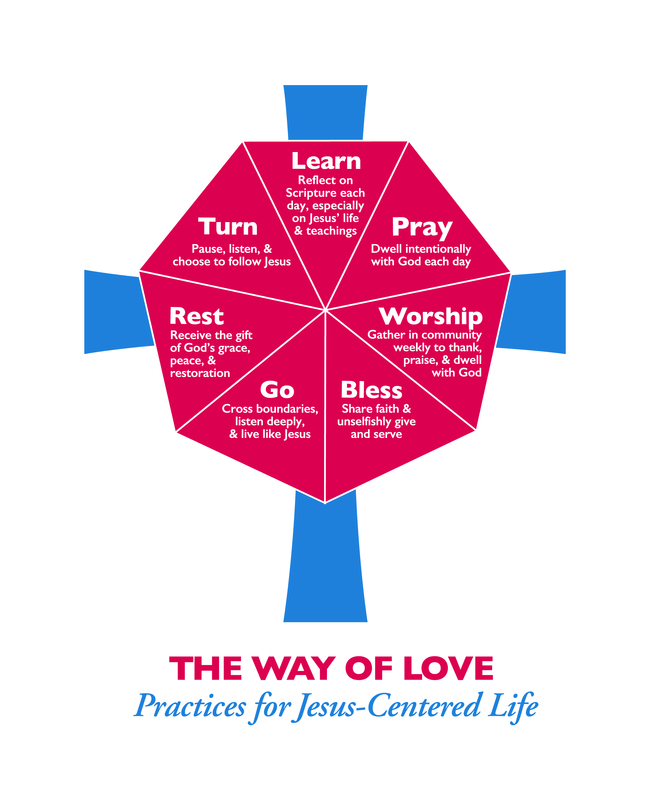 As part of the invitation to live the way of love, Bishop Curry used seven words and seven Scripture passages as the basis for the “Way of Love.” The words are Learn, Pray, Worship, Bless, Go, Rest and Turn. Each one when lived out and practiced in daily life could help us live a life modeled on Jesus and embody the love that he brought to this world through his life, death and resurrection. Each week during the sermon series, we looked at each word and a Scripture passage that connected with that word. We asked the questions, how does the world connect us to God’s love and if lived out how can this practice help us live as Jesus lived and love as Jesus loves us? I found the sermon series to be very powerful and practical. As we got further into the series, I saw my own life and the life of Resurrection Church being shaped by these words and by the daily practice that drew us closer to God’s love. The practical takeaways were amazing. The more we learn about Jesus’ life the more we can live like him. The stronger our prayer lives become, the more we can be filled with God’s love and in turn love others. As we turn away from our own sin, we can turn toward the life God has called us to live and to be an example of his love in the communities we live and work. The site gives great information about the Way of Love and resources you can use to read, experience and live the practices each day. What I encouraged Resurrection Church to do is to think about that week’s word each day and to read the Scripture passage throughout the week. Let it become part of your devotional time or your daily prayer life. What does each appointed word mean for you in your life? How can that word draw you closer to God in a way that connects you to the love of God? How can those words be turned into daily and weekly practices that help you experience God’s love and then live out that love in your community? Give “The Way of Love” a try and see how the practices change your life and how God’s love becomes more real each and every day. The Rev. Jason Shank is the priest of Resurrection Church in Hermitage.